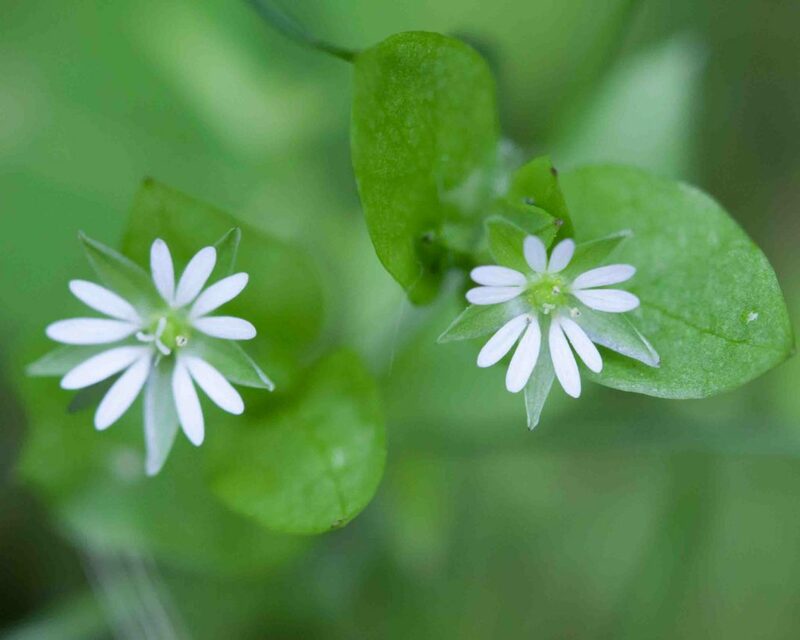 This chickweed is easily distinguished from Common Chickweed (Stellaria media) by its larger (and more attractive) flowers and by the shallower lobes and prominent veins of its petals. 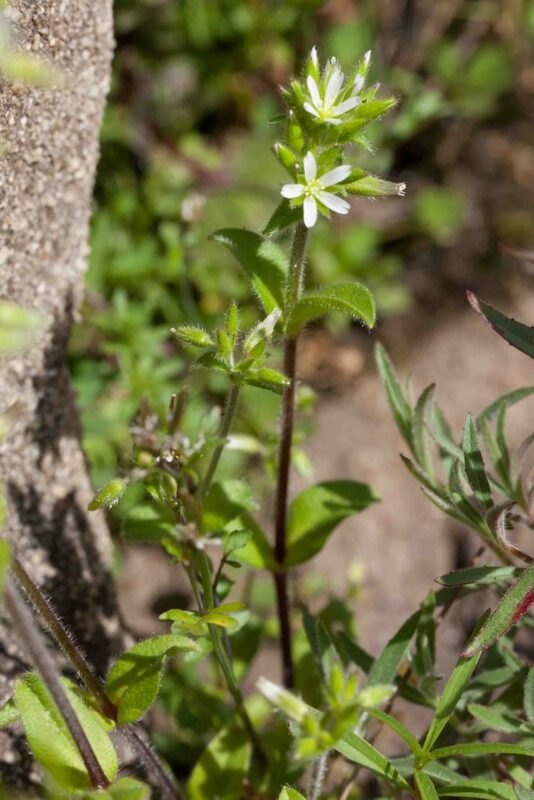 It has prostate non-flowering and erect flowering stems with 8–25 mm long, linear to lanceolate leaves. 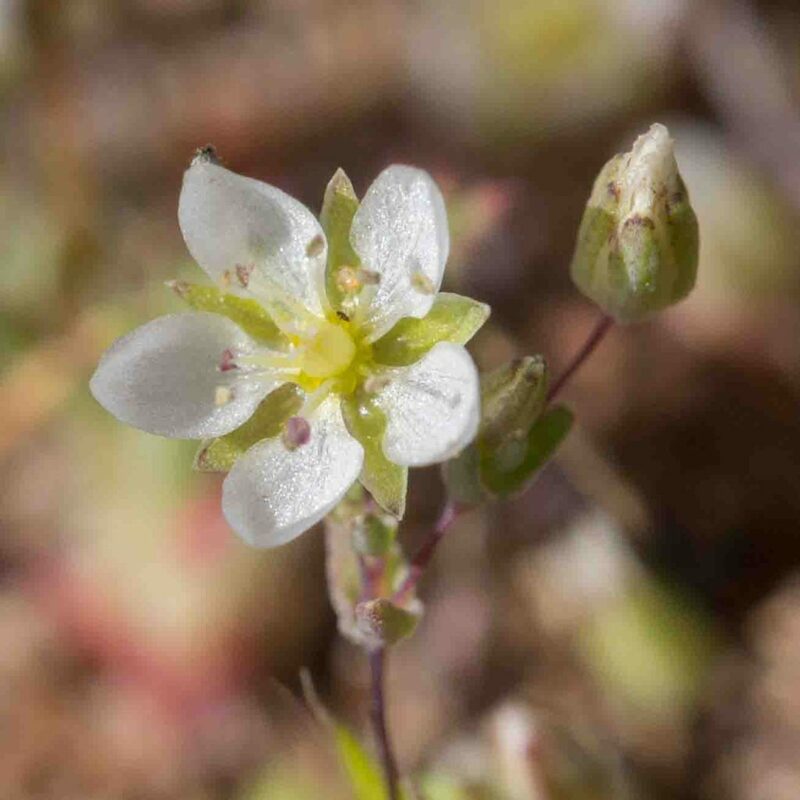 This has smaller (and less attractive) flowers with much narrower petals than those of Field Mouse-ear Chickweed (Cerastium arvense). 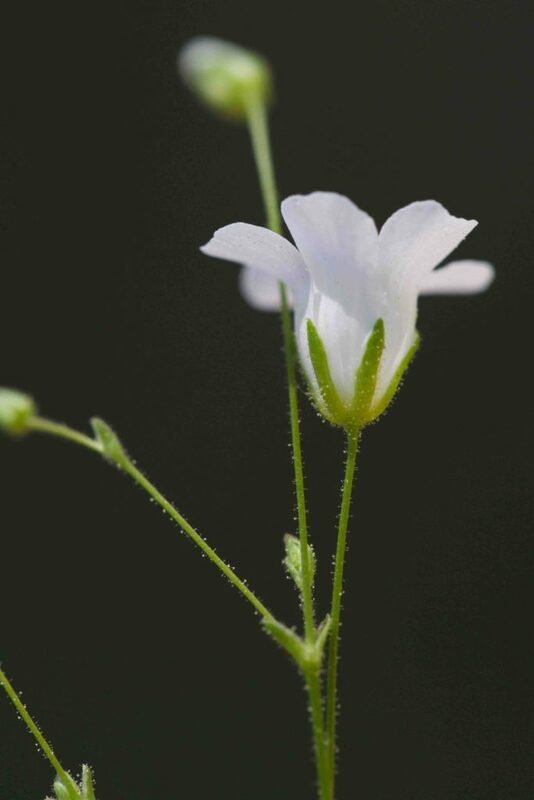 Petals and sepals are of similar length. 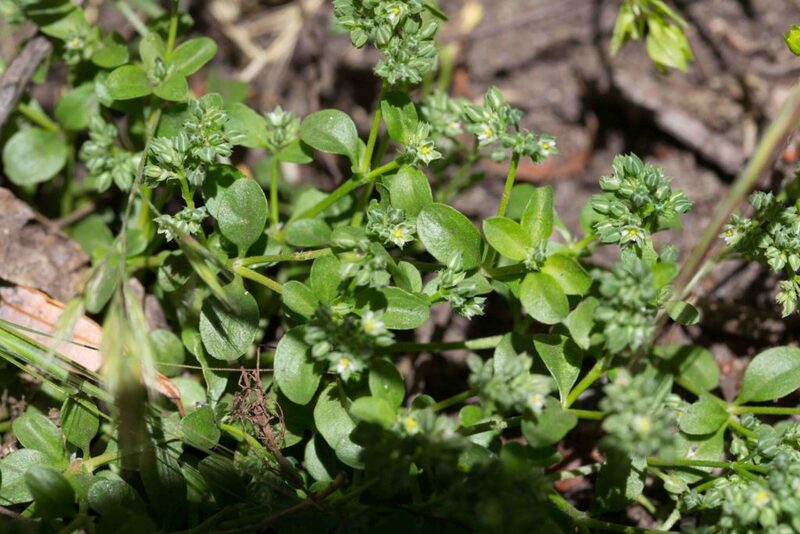 “Glomeratum” refers to the densely clustered flowers and the stickiness is evident from the glandular inflorescence. 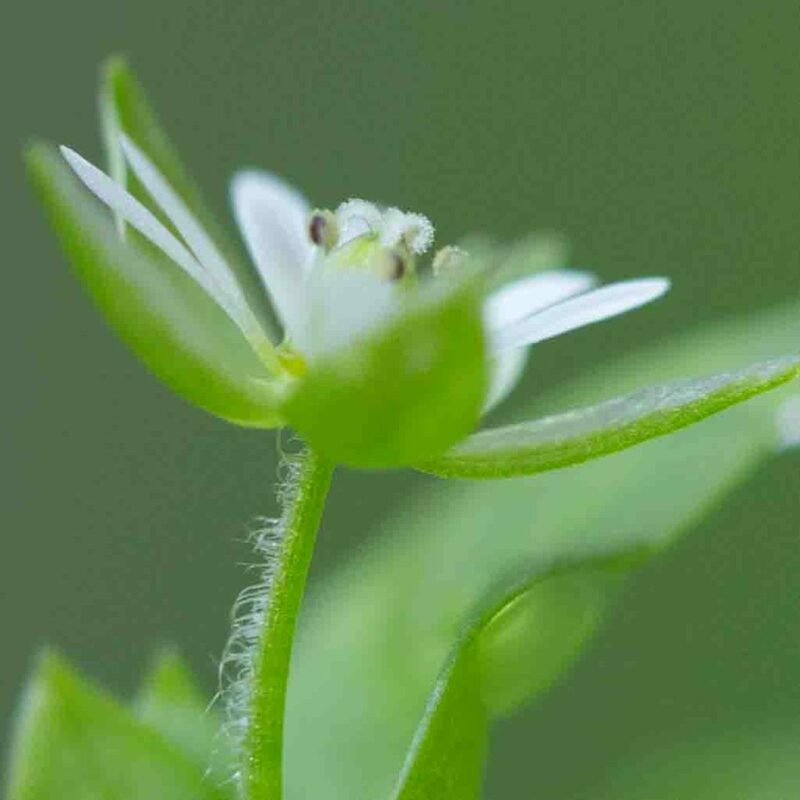 Unlike Common Chickweed (Stellaria media), the stems have hairs all around them rather than being confined to one side only. 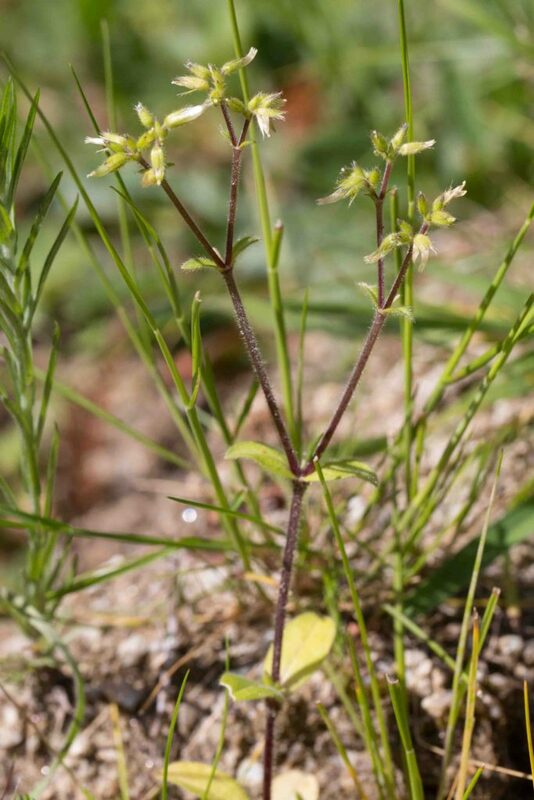 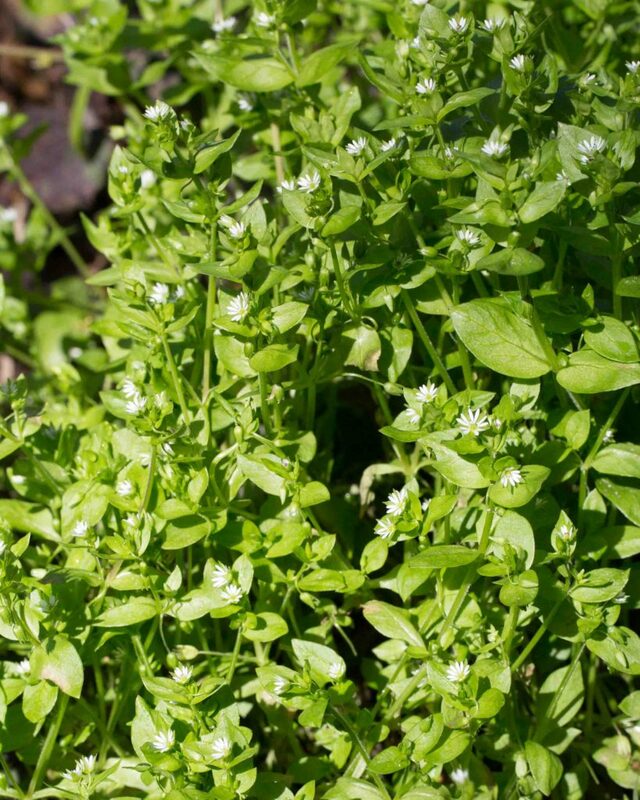 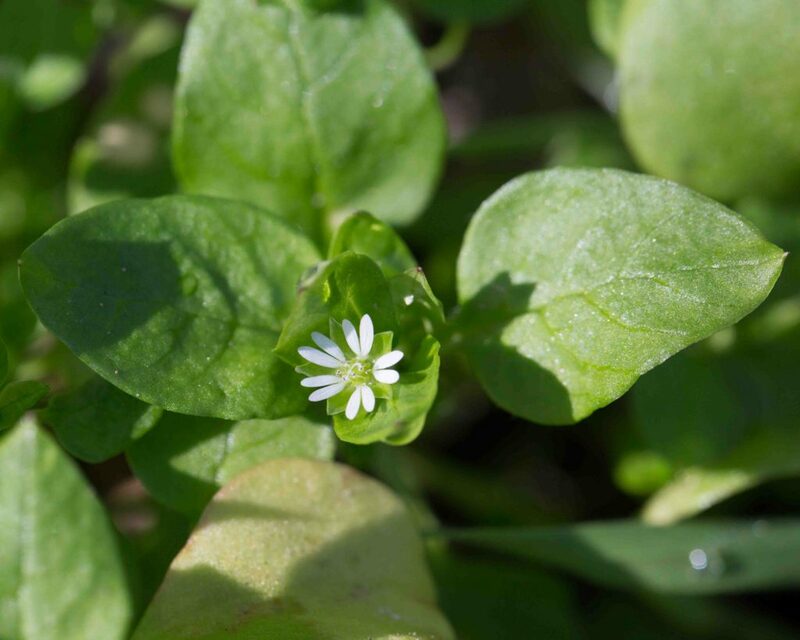 This very common chickweed is low growing with small white flowers that appear as if they have 10 petals but in fact have five that are deeply cleft, almost to their base. 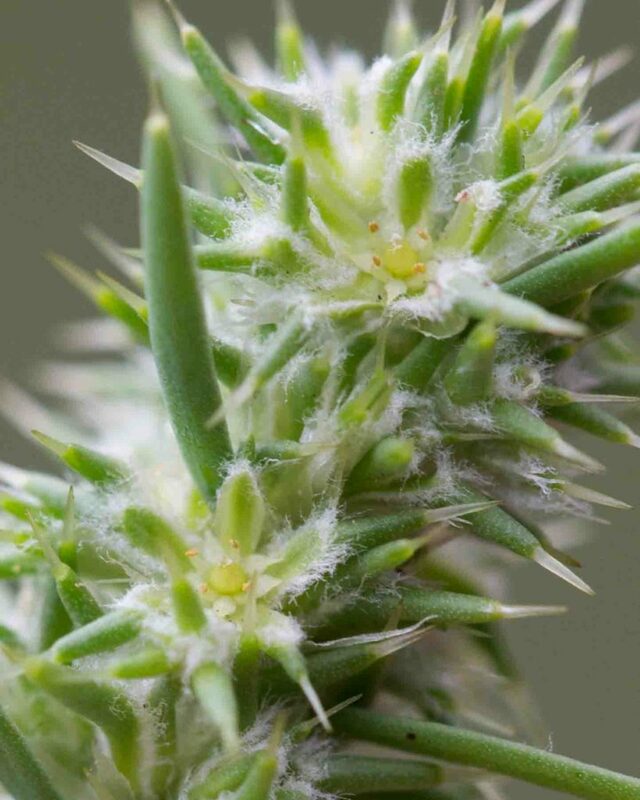 Note that the hairs on the stem are confined to one side. 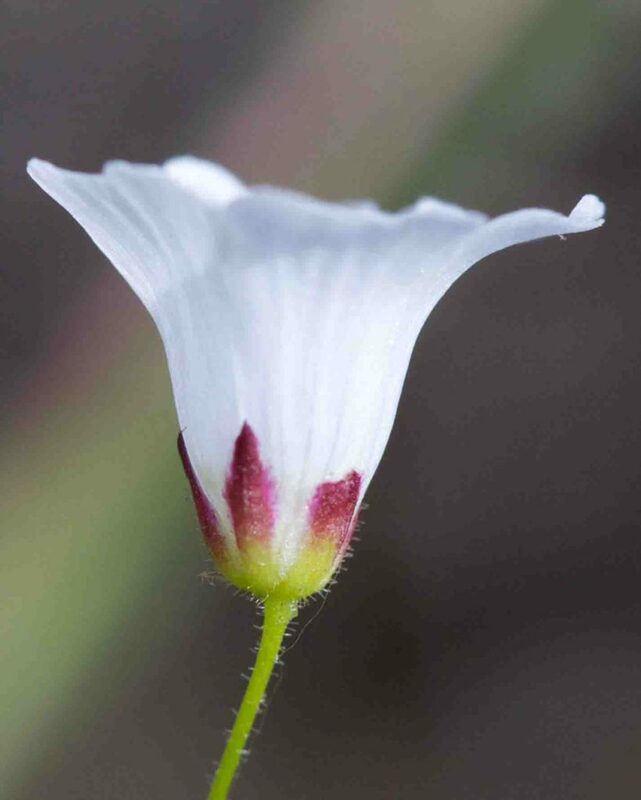 A charming little bell-shaped flower borne on slender branching stems with petals that are sometimes but not always notched. 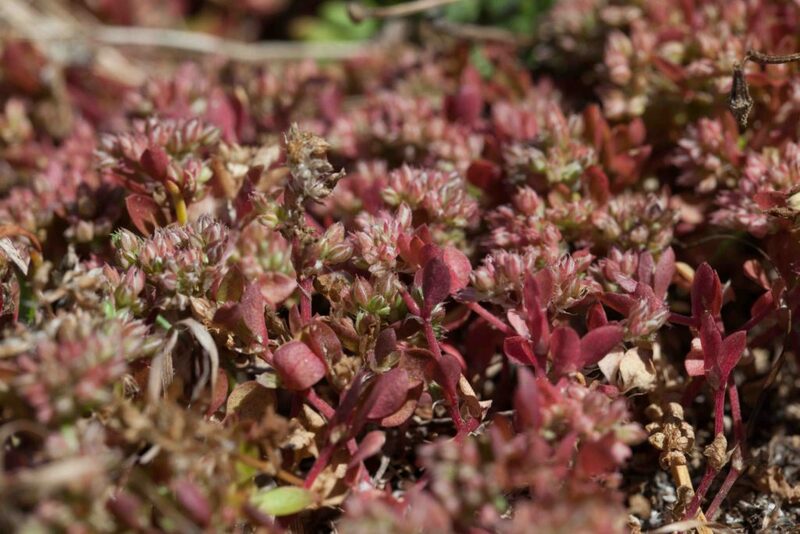 Most of the thread-like leaves wither before flowering, though some remain visible towards the base of the stems. 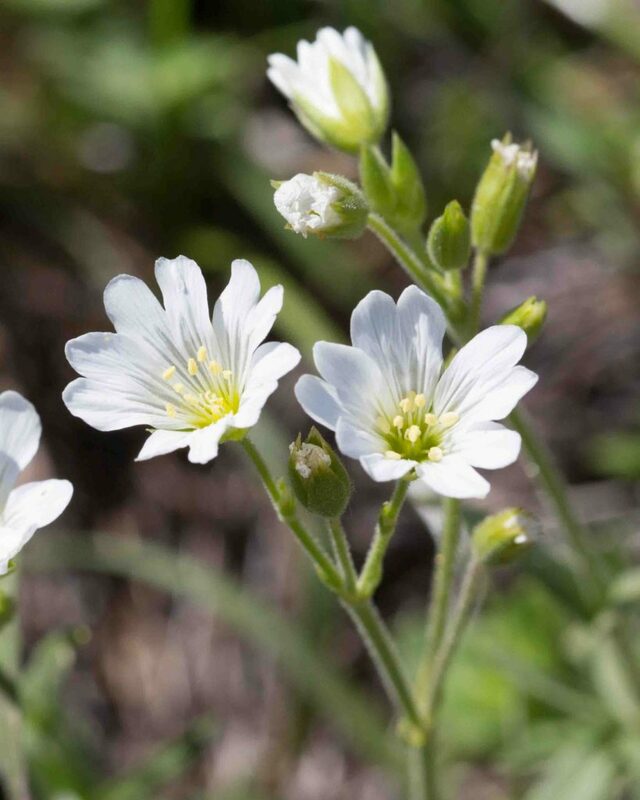 The sepals vary a little in appearance, sometimes red-tipped, sometimes a little narrower and without the red tip. 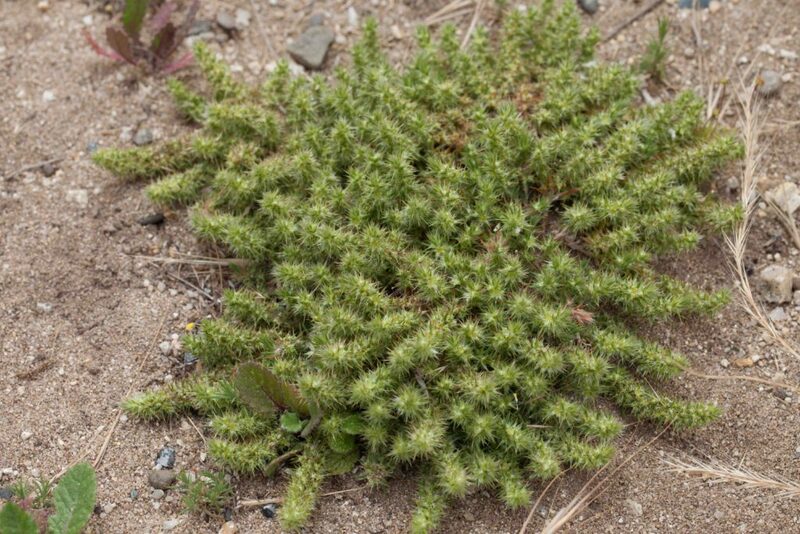 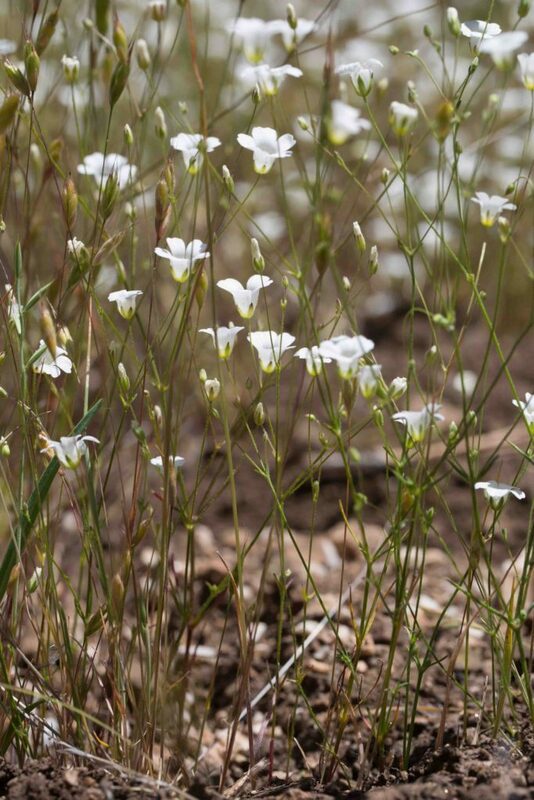 The plant is consistently glandular-hairy, unlike the other Minuartia found in Monterey County. 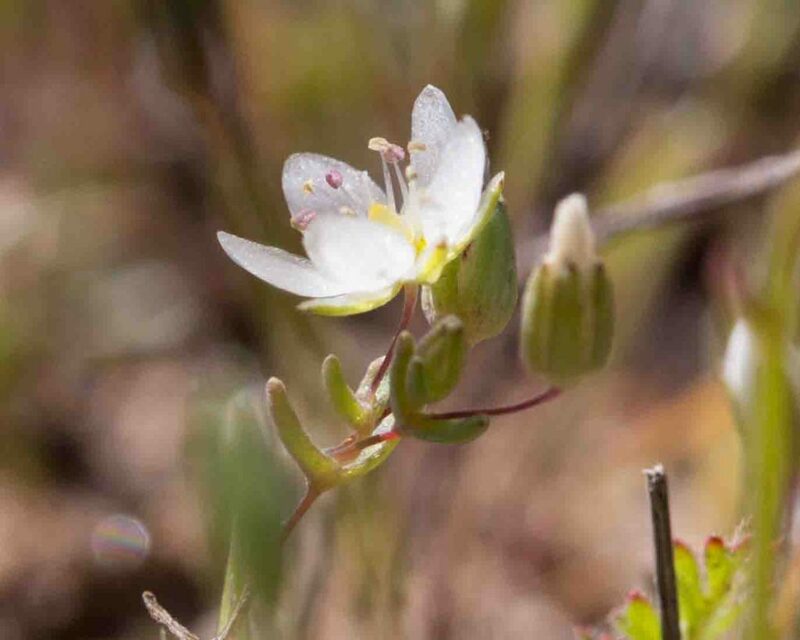 A beautiful little flower, not often seen but can appear in quantity. 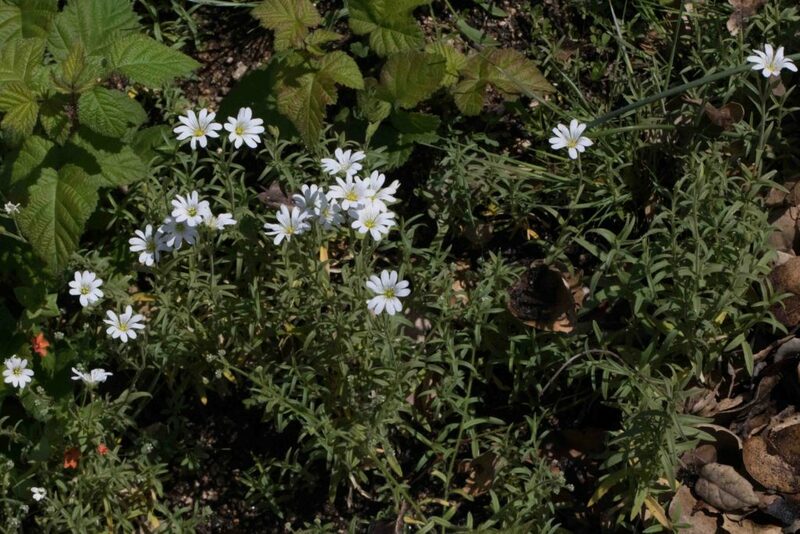 The plant is widely spreading to erect, simple or branched. 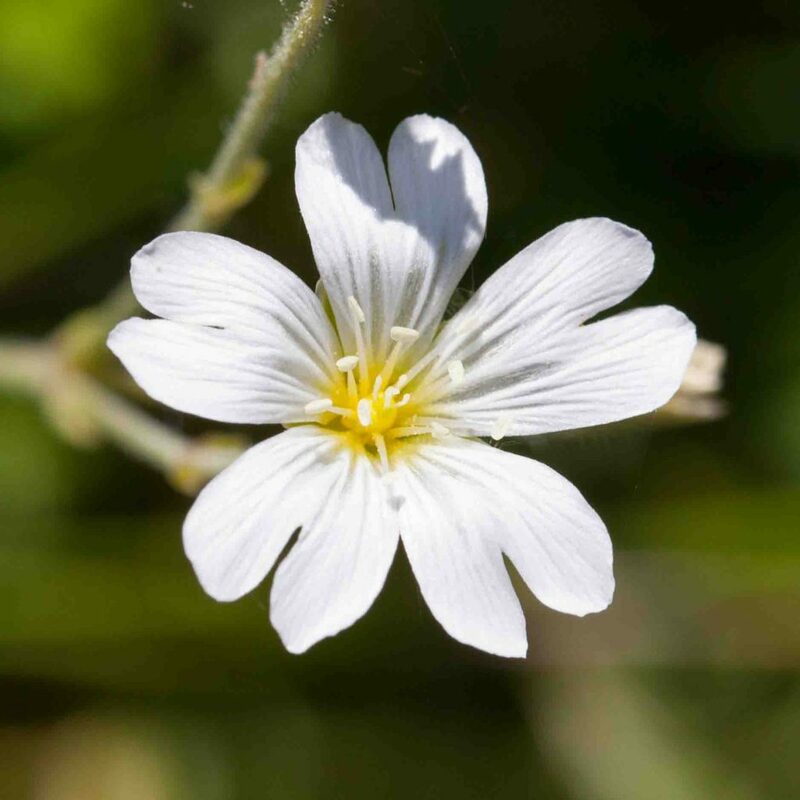 Flowers are pure white with pink anthers. 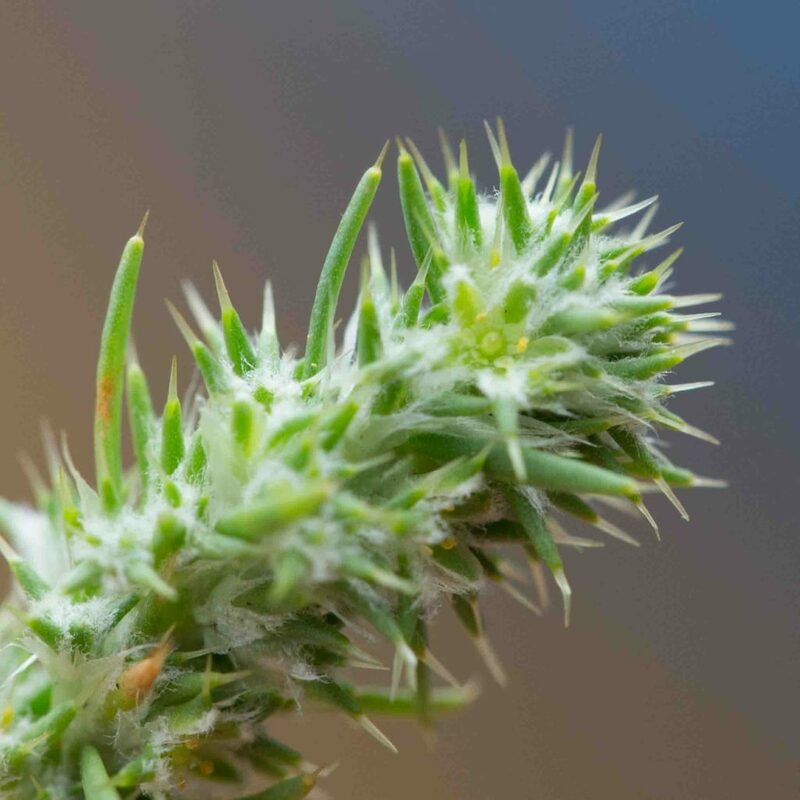 Leaves are 2–5 mm long and < 1.5 mm wide, linear to narrowly oblong. 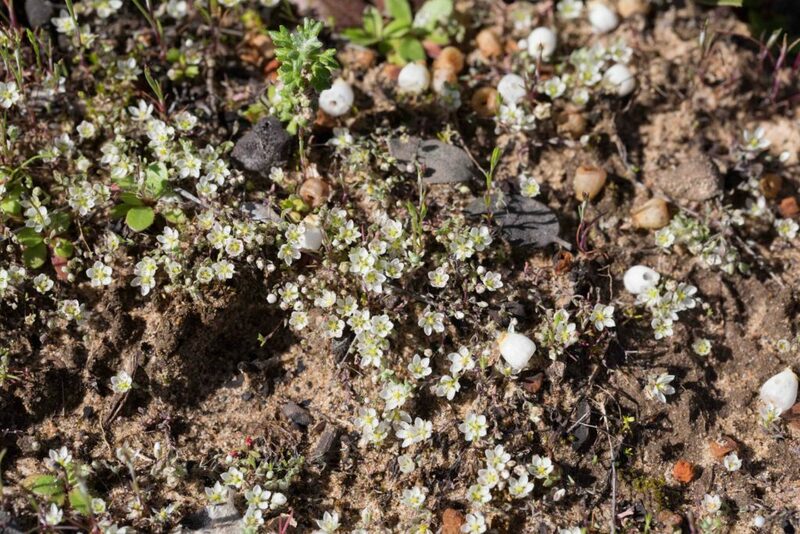 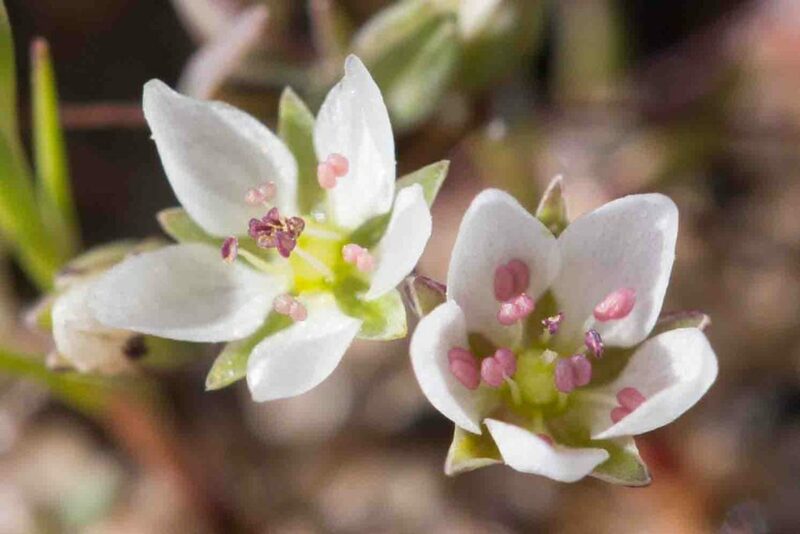 The white, bell-shaped flowers in the right hand photo are from a nearby manzanita; these give a sense of how tiny the flowers of this sandwort really are. 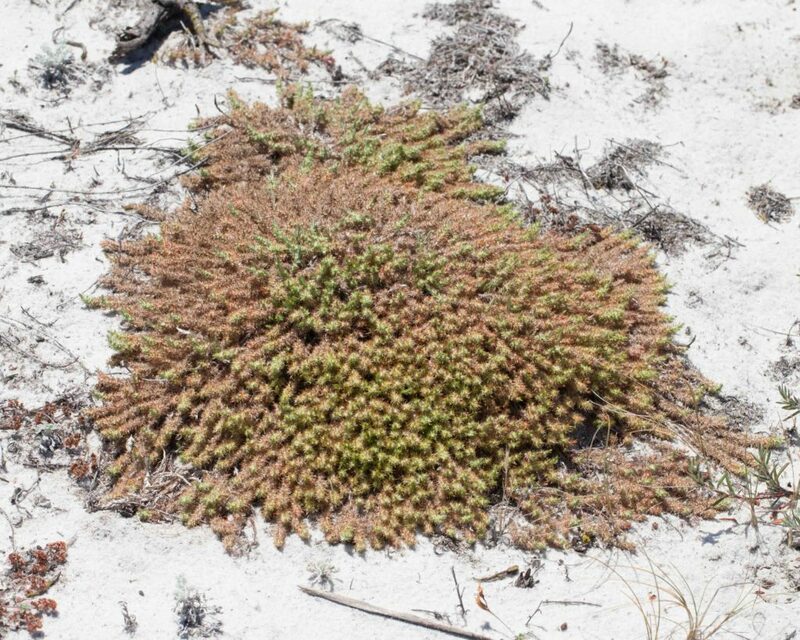 Very common, forming a prostrate mat on trails or other sandy areas. 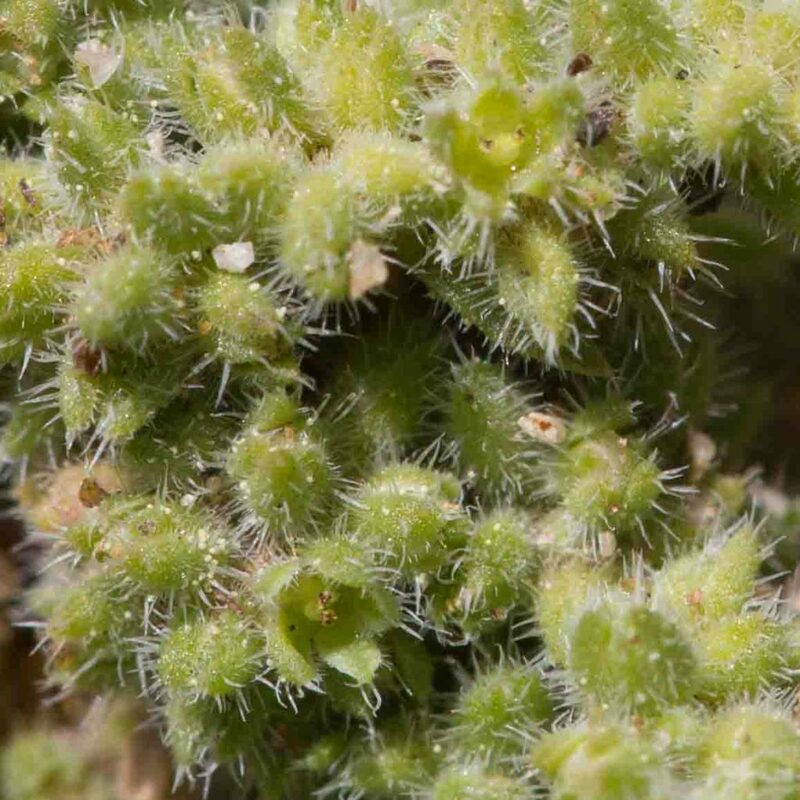 Leaves are awl-shaped and spine-tipped and so quite prickly to the touch. 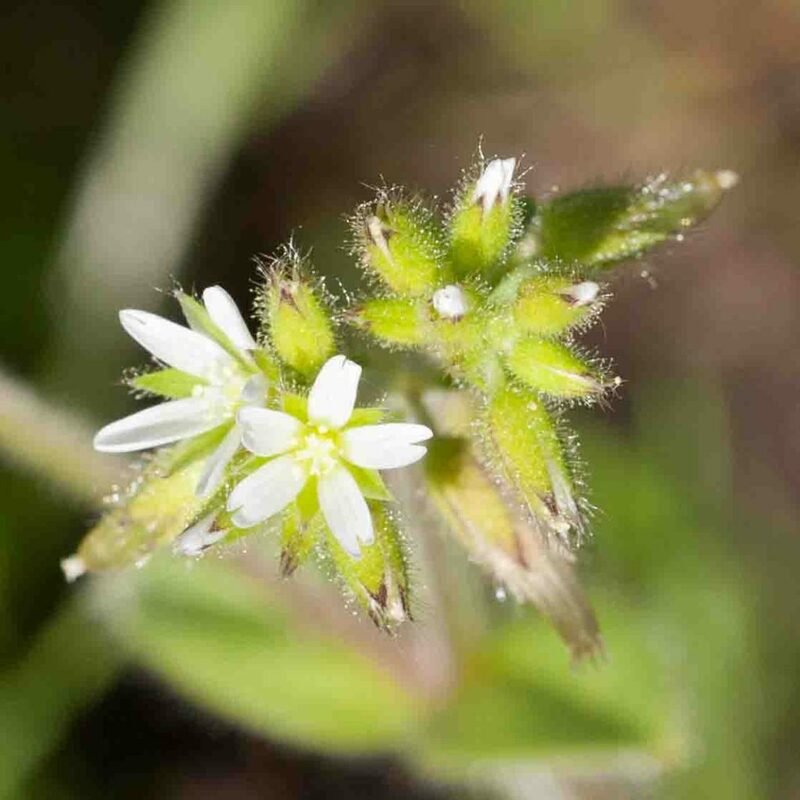 Flowers are minute, with greenish, white-hairy sepals and tiny (< 0.5 mm) white, scale like petals. 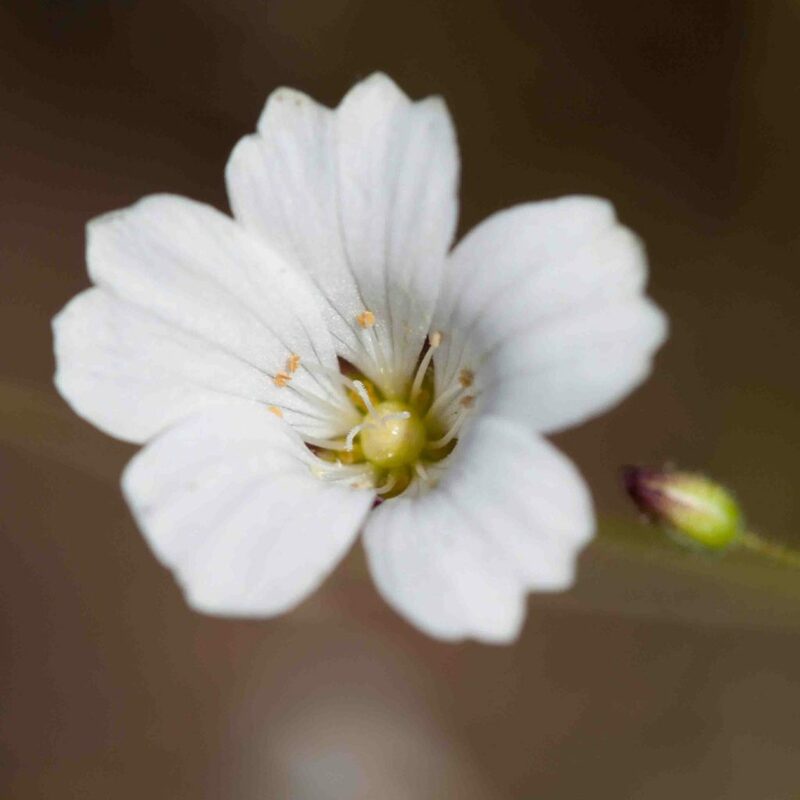 A hand lens is almost required to see the flower at all, let alone its finer details. 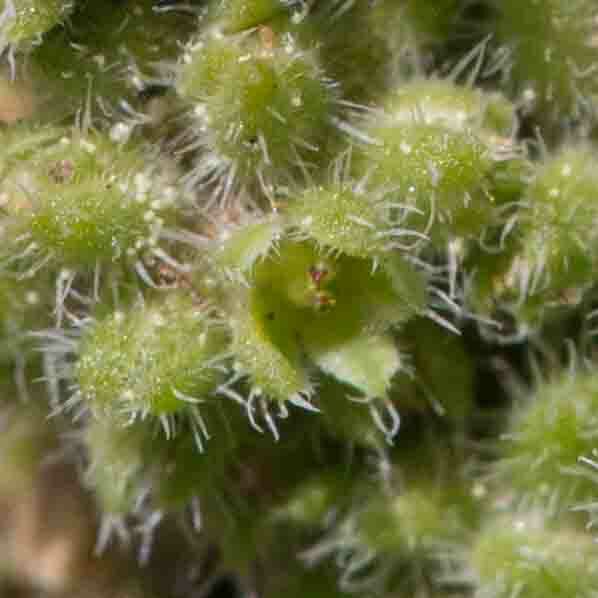 Another prostrate, mat-forming plant, densely hairy with pale green, ciliate leaves, oblong to oblanceolate, 3– 12 mm long. 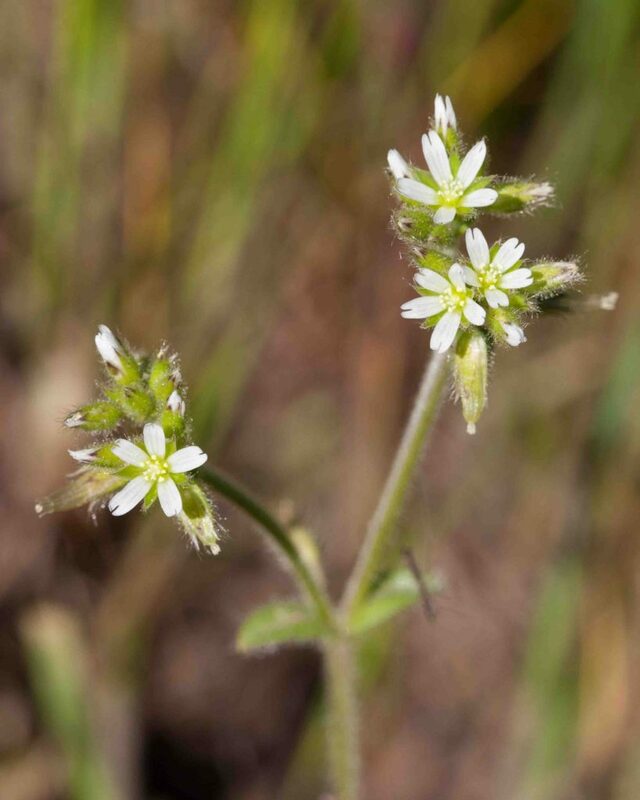 The inflorescence comprises 3–8 minute (1–2 mm) petal-less flowers with green sepals. 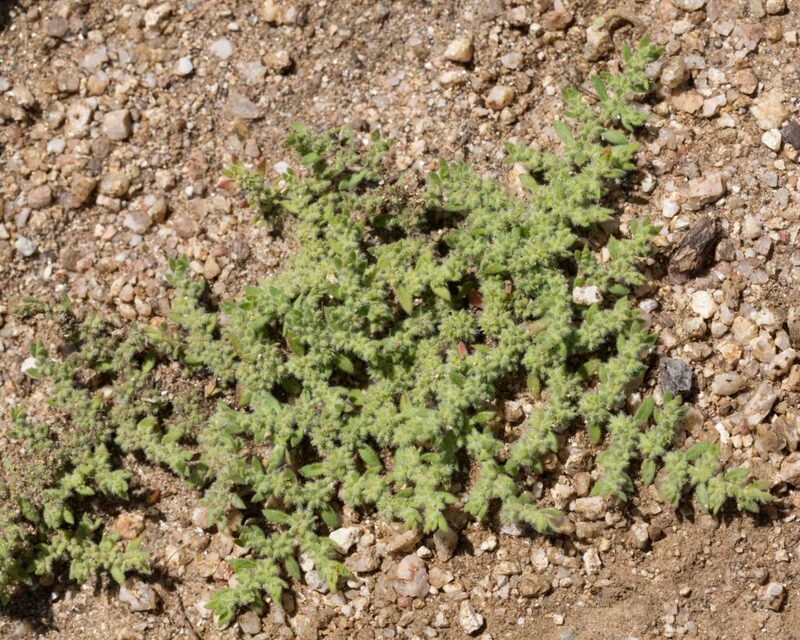 Another prostrate plant which can form extensive mats. 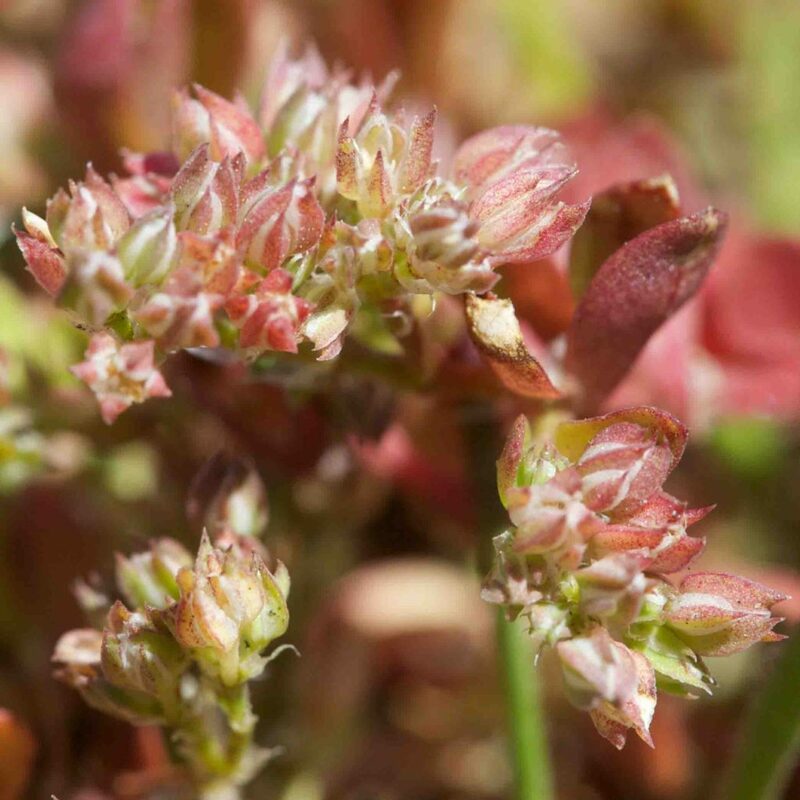 Leaves and flowers are green when young but pinkish when mature. 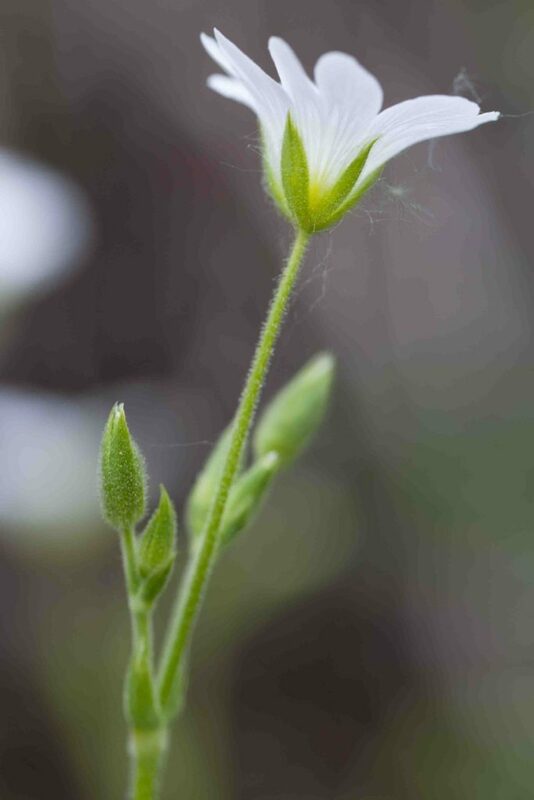 The flower color comes from the lanceolate to ovate, awned sepals.